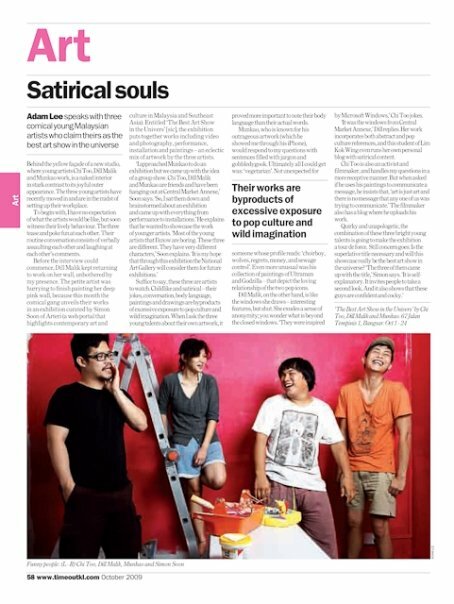 Adam Lee speaks with three comical young Malaysian artists who claim theirs as the best art show in the universe. Behind the yellow façade of a new studio, where young artists Chi Too, Dill Malik and Munkao work, is a naked interior in stark contrast to its joyful outer appearance. The three young artists have recently moved in and are in the midst of setting up their workplace. To begin with, I have no expectation of what the artists would be like, but soon witness their lively behaviour. The three tease and poke fun at each other. Their routine conversation consists of verbally assaulting each other and laughing at each other’s comments. Before the interview could commence, Dill Malik kept returning to work on her wall, unbothered by my presence. The petite artist was hurrying to finish painting her deep pink wall, because this month the comical gang unveils their works in an exhibition curated by Simon Soon of Arteri (a web portal that highlights contemporary art and culture in Malaysia and Southeast Asia). Entitled ‘The Best Art Show in the Univers’ [sic], the exhibition puts together works including video and photography, performance, installation and paintings – an eclectic mix of artwork by the three artists. Suffice to say, these three are artists to watch. Childlike and satirical – their jokes, conversation, body language, paintings and drawings are byproducts of excessive exposure to pop culture and wild imagination. When I ask the three young talents about their own artwork, it proved more important to note their body language than their actual words. Munkao, who is known for his outrageous artwork (which he showed me through his iPhone), would respond to my questions with sentences filled with jargon and gobbledygook. Ultimately all I could get was: ‘vegetarian’. Not unexpected for someone whose profile reads: ‘choirboy, wolves, regrets, money, and sewage control’. Even more unusual was his collection of paintings of Ultraman and Godzilla – that depict the loving relationship of the two pop icons. Dill Malik, on the other hand, is like the windows she draws – interesting features, but shut. She exudes a sense of anonymity; you wonder what is beyond the closed windows. ‘They were inspired by Microsoft Windows,’ Chi Too jokes. ‘It was the windows from Central Market Annexe,’ Dill replies. Her work incorporates both abstract and pop culture references, and this student of Lim Kok Wing even runs her own personal blog with satirical content. Chi Too is also an activist, and filmmaker, and handles my questions in a more receptive manner. But when asked if he uses his paintings to communicate a message, he insists that, ‘art is just art and there is no message that any one of us was trying to communicate.’ The filmmaker also has a blog where he uploads his work.